IN THIS KITCHEN PRAYER, LOVE IS ALWAYS THE KEY INGREDIENT. This Irish spoon rest features a kitchen blessing along with shamrock accenting and it is complete with green ribbon for display. 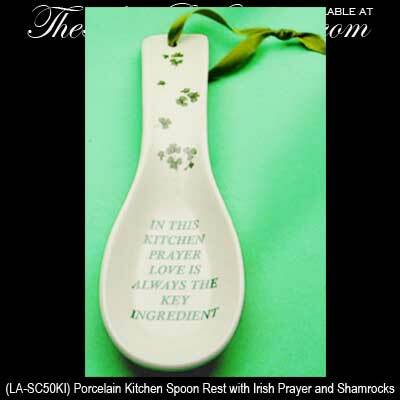 The Irish kitchen prayer spoon holder is 9" long and 3" wide and it is enhanced with a green design on white porcelain. The Irish blessing spoon rest is made in Ireland by Liffey Artefacts and it is gift packaged with a shamrock history card that is complements of The Irish Gift House.